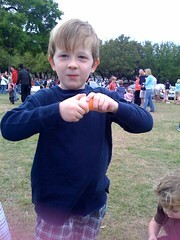 Last year was the first year we took Alec (and Julia) to the annual Steiner Ranch Easter Egg Hunt. When the horn went off and everybody stampeded, Alec got a bit overwhelmed and kinda decided to bag it. 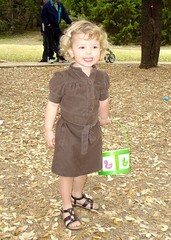 Julia; however, nicely picked up eggs and carefully placed them in her basket proudly showing daddy of her find. Alec, who is 5.6 years old strategically scouted out the best route to ensure he would score sufficient loot. When we got there, he carefully calculated the axis, diameter and radius of the field, estimated the number of children per age group and positioned himself to swiftly swoop in and seize the eggs a millisecond before another kid could. When the horn went off this year, he faked us all out and headed straight for the 7+ year old age group’s ‘section’. He had his max of 12 in less than 30 seconds and covered at least 5000 square feet of ground. Julia on the other hand, being toward the top of her age group, used her size and authoritative nature to knock over most of the children, fleecing them of their eggs and darting off prior to the victims even noticing who pilfered their goods. I wonder who each of my kids take after. Actually, it was Grandma who was egging (sorry) Julia on, barking out commands like a sargeant major on a parade ground. I just tried to stay out of the way. Happy Easter! I love the pictures! OMG - LOL! I wish we had been flies on a wall! WOW, Alec looks so old. I guess I have this image in my head of 2 year old little Alec when I use to cut his hair. They are very cute, by the way!! !